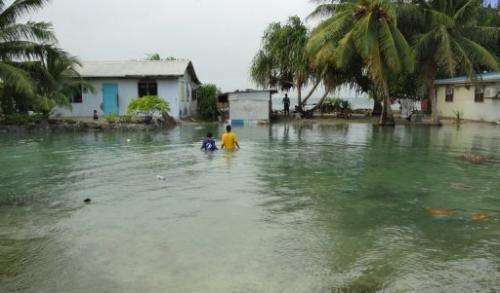 Residents wade through flooding caused by high ocean tides in low-lying parts of Majuro Atoll, the capital of the Marshall Islands, on February 20, 2011. The Marshall Islands has warned that the clock is ticking on climate change and the world needs to act urgently to stop low-lying Pacific nations disappearing beneath the waves. The Marshall Islands has warned that the clock is ticking on climate change and the world needs to act urgently to stop low-lying Pacific nations disappearing beneath the waves. Marshalls Foreign Minister Phillip H. Muller issued a plea for action as he prepares for next week's Pacific Islands Forum (PIF), which includes some of the countries most affected by the rising seas blamed on global warming. "We want to work as hard as we can to see if there is a possibility of having our islands continue to exist," Muller told AFP in a telephone interview from the capital Majuro late Thursday. "That's why we're calling for urgent action from our friends around the world. The longer we wait, I'm afraid we may reach the point of no return." The centrepiece of next week's summit in the Marshall Islands will be the signing of the Majuro Declaration, which Muller said was an attempt to reinvigorate the international community's stalled efforts to address climate change. He said the declaration would set concrete, achievable goals on emissions reductions and climate change mitigation measures for the 15 member states of the PIF, which is mostly made up of developing nations. Muller said the PIF wanted to set an example to the rest of the world and it would take the declaration to the United Nations in late September and urge other countries to adopt it. 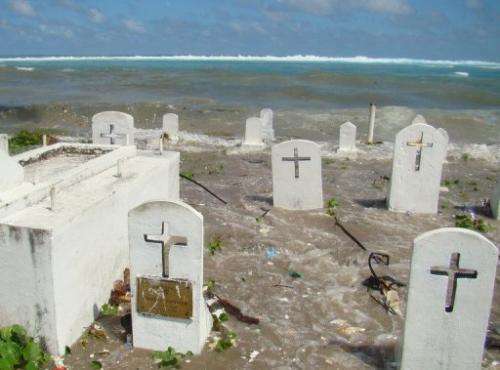 A cemetery on the shoreline of the Marshall Island's Majuro Atoll is flooded during high tide, in 2008. Marshalls Foreign Minister Phillip H. Muller issued a plea for action as he prepares for next week's Pacific Islands Forum (PIF), which includes some of the countries most affected by the rising seas blamed on global warming. "This is a real issue for us. We're already experiencing some of the impacts of climate change," he said. "So I think morally and practically we are the ones that need to rise up and say 'something's got to be done', not just in rhetoric and in meetings, but in real terms." He said the Marshalls, a nation of 55,000 people made up of 29 atolls standing an average two metres above sea level, were on the frontline of climate change. Areas of the country have been suffering from drought for most of the year, record king tides inundated Majuro in June and rising seas have eroded seawalls and causeways, as well as turning drinking water brackish and causing crops to fail. Asked when the world needed to act, Muller replied: "It should have been yesterday." He was optimistic climate change could be contained, but only if immediate action is taken. "Waiting for another few days, or a year or two, isn't good enough," he said. "We need to re-energise the international community and make them aware that there are countries that may not be in existence much longer." He said the peoples of the Pacific did not want to become climate change refugees, forced from their homes by the encroaching sea. Kiribati, a PIF member, has already announced plans to purchase 2,000 hectares (5,000 acres) of land in Fiji to provide food for the tiny nation and possibly act as a new island home. Muller said the Marshall Islanders feared they too might have to make plans to flee if nothing is done to halt climate change. "We love our country, our culture and our islands," he said. "We're hoping that we won't have to relocate, that's a choice that we don't want to make."